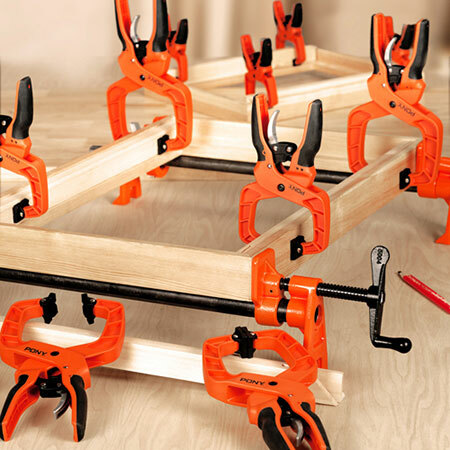 For DIY enthusiasts looking for clamps made with the highest‑quality materials, unwavering reliability, and trusted strength, there’s only one choice according to the experts - the original Pony Jorgensen range of clamps. The company only uses high-quality ductile cast iron, drop-forged, high-carbon steel, and anodized aluminium in their clamps. Zinc or chrome plating is added to many clamps for increased durability and rust resistance. Cold-drawn steel screws let you clamp with confidence. Available in aluminium and steel they have an excellent strength-to-weight ratio, making them strong, lightweight perfect for both commercial and DIY applications. The bars are crafted from an anodized, rust-resistant aluminium, and their rectangular design creates a stable clamping surface for edge gluing. The tail-stop’s trigger spring takes advantage of notches on the bar to lock into place. The steel version bar clamps are seriously strong, cast-iron stationary and sliding heads, merged with a high-carbon, rust-resistant steel bar that packs a whopping 100,000 pounds per square inch of tensile strength. The iconic Pony 1.9 cm pipe clamp has become America’s most popular and widely used pipe clamp fixture design. The original steel multiple-disc-clutch design allows a secure hold and instant adjustment at any point along the pipe, without fear of slipping or pipe crushing. Crafted with strong, durable iron casting. The most popular and complete line of light and heavy-duty C-clamps. The smoothly cut, acme-threaded steel screw is zinc plated and protected with a black finish for lasting durability. The clamp casting is made with ductile iron for strength before receiving a powder-coated Pony-orange finish. Available in a wide variety of sizes and clamping forces, all with full-closing screws. The metal spring clamps are some of the most durable clamps available, and the hand clamps allow for pressure adjustments to meet any woodworking need. 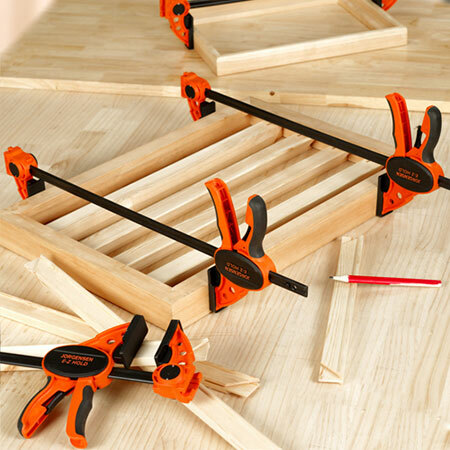 Keep your next round, rectangular, or irregularly shaped woodworking project together with the range of quality nylon, canvas, and rapid-acting band clamps. When a traditional clamp just won’t cut it, grab a Pony Jorgensen specialty clamp. Choose among iconic Jorgensen handscrew clamps, hold-down clamps, cabinet claws, press screws, gear, and edging clamps. 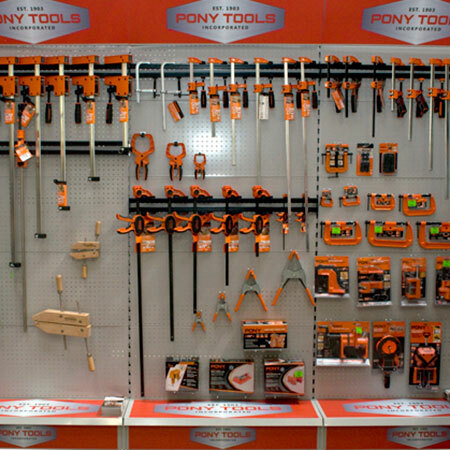 To view the full model range in each category, go to www.vermontsales.co.za - Pony Jorgensen Clamps web site. Pony Jorgensen is a leading brand in the Vermont Sales operation and is available at leading specialist stores countrywide.